The laughing call and rhythmic drumming of the pileated woodpecker often echo through the forest at the back of my property. The pileated is 17 inches in size, it's a big bird. Thank you so much for putting my photo of the Redpoll from yesterday on the PP, so pleased you liked him! fab capture. We have on behind our house . The selective coloring and focus are superb! Amazing that you see these all the time! He looks beautiful with the snowy background. Wonderful capture. Wow, you are still having snow. I definitely hear him before I see him! This is an awesome close-up shot - just look at the detail on those claws. Great b&w with touch of red! These are so cool and of course a lot bigger then my downy woodpecker. I am so jelly of your piliated shots!simply stunning.white stuff and all! Instant fav - that pop of red is fabulous! Great shot! They are so elusive here. But I do see them once in a while. Great details- love the bright red feathers! Lovely capture !! 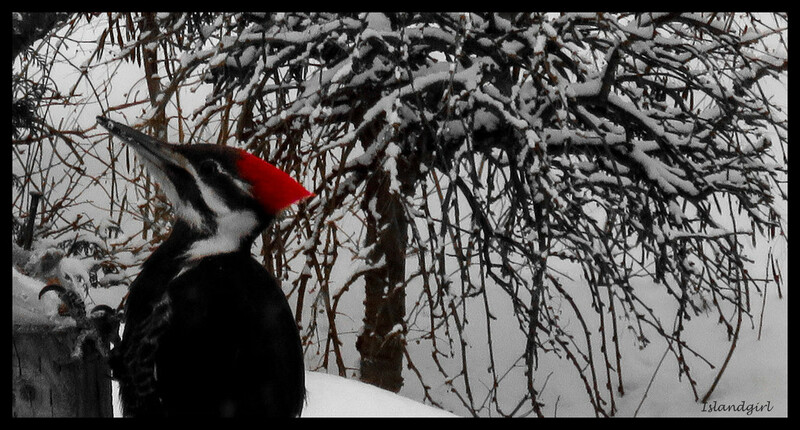 I like the tones and the tree in the behind really gives a nice back ground to this lovely pileated. Fav !! Great photo, I love his red crown. love these guys…ours won't let me get anywhere near them..gak! Love this and he must be quite a large bird. I 'd love to see such a big woodpecker! While up the coast visiting our daughter, I hear the woodpeckers all the time, but they're small. I did, however, photograph some cut trees that were set aside and they're peppered with little holes! Great use of sc. Beautiful capture. Great capture, love the red amidst the black and white. Super capture with his red head! Fabulous how that red stands out Kathy. They are such neat birds! Super shot - very dramatic with the black of the bird & tree, offset by the red and white. Excellent comp, congrats on another PP image. Love this, especially the red bit. Congrats on the PP appearance!